In this very historic bout, the highly decorated and much younger fighter will be competing for a major world title in only his second professional outing against the hard nosed veteran and proven three time world champion. After dominating and stopping rugged Featherweight contender Jose Ramirez in his pro debut, which took place on the undercard of the Top Rank PPV event, "Marquez vs. Bradley", the Ukrainian born technician controversially put himself in line for the highly anticipated showdown with the Mexican born title holder. Many fight fans and boxing pundits feel that the former Olympian hasn't accomplished enough as a professional to garner the coveted title opportunity, but very few fighters throughout the history of the sport have achieved as much on the amateur level as Lomachenko. Throughout his amazing amateur campaign, the talented southpaw technician racked up an unprecedented record of 396-1, against top level and global opposition without any kind of notice or careful selection made by a promotional group or experienced matchmaker. Most young "blue chip" prospects have the luxury of being carefully pitted against opponents by a manager or promoter upon turning pro. Vasyl Lomachenko did not enjoy that privilege during his incredible run for Olympic gold, and was forced to adapt and overcome many different style match-ups during this challenging process. Orlando Salido represents the other end of the boxing spectrum by having to learn on the job over a span of eighteen years as a professional. After beginning his pro career with an 8-7-1 record, the hard working, aggressive puncher was forced to take fights on short notice, while being featured on other promoters' cards as a B-side fighter. With persistence, determination, and discipline, the 33 year old Mexican fighter finally captured Championship gold by defeating Cristobal Cruz in 2010, and officially announced his arrival as a legitimate force in the talent enriched 126 pound weight division. After two additional title winning efforts against Juan Manuel Lopez and Orlando Cruz, Salido is determined to prove that no amateur background can compare to the hard lessons a fighter can only learn in the professional ring. Who will prevail on Saturday, March 1st, the eighteen year experienced professional, or the highly decorated amateur technician? We will find out this weekend at the Alamodome in San Antonio, Texas!! Both "Chavez vs. Vera 2" and "Salido vs. Lomachenko" will be televised on "HBO: World Championship Boxing" with a start time of 9:45 PM EST/PST. The fantastic card is promoted by Top Rank®, in association with Zanfer Promotions, Banner Promotions, Foreman Boys Promotions and Tecate, remaining tickets to Chávez vs. Vera II, priced at $200, $100, $60, $40 and $25 (plus applicable taxes and fees), can be purchased at the Alamodome box office, all Ticketmaster outlets, online at www.ticketmaster.com and via Ticketmaster charge-by-phone lines at (800) 745-3000. 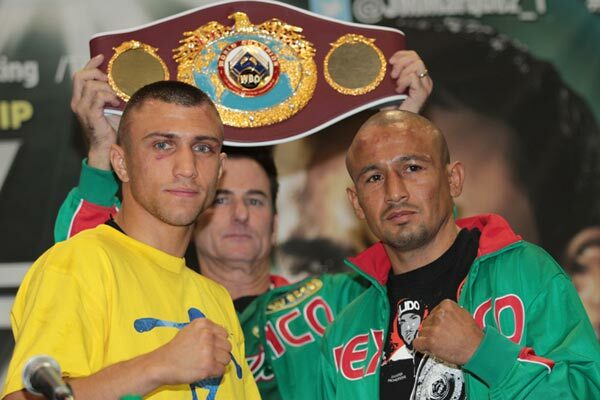 Vasyl Lomachenko (1-0): Is it too early for title shot against the solid Salido? Vasyl Lomachenko (1-0 1KO), who recently turned pro, hopes to make history by winning a world title in only two bouts. Already a legend in the amateur game, the 26 year old Lomachenko boasted a magnificent record of 396-1, with only loss, to Albert Selimov, avenged twice. He has won multiple gold medals in both world and European championships as well as Olympic gold at the 2008 and 2012 games but the man he'll face next month is as tough as they come. With WBO Featherweight Champion Orlando Salido (40-12-2 28KO) in the opposite corner, any opponent is almost guaranteed a remarkably tough night. The fighter known as “Siri” may not have a pristine record but he has given elite opponents a real examination. Opponents such as Juan Manuel Lopez (then 30-0), Juan Manuel Marquez (then 42-2-1), Robert Guerrero (then 19-1-1), Yuriorkis Gamboa (then 18-0) and Mikey Garcia (then 30-0) have all been pushed to the limit by Salido. Facing Salido would be daunting task for any seasoned veteran let alone a boxer with only one pro fight and a few bouts in the World Series of Boxing. Saensak Muangsurin, a former WBC light welterweight champion, set a world record by winning the world title in only his 3rd professional fight. Can Lomachenko trump Muangsurin and rewrite the history books or will this risky encounter be an unwelcomed blemish on the record of a potential cash cow and multi weight world champion? Some believe it's too early for Lomachenko to face such a relentless stalker like Salido, a pressure fighter with a rock solid chin. Win or lose, Lomachenko must be commended for wanting to fight the best. If he can halt the stubborn Salido then Vasyl Lomachenko's future may be very bright indeed. Orlando Salido (40-12-2) vs. Vasyl Lomachenko (1-0-0) will take place March 1 on the Chavez vs Vera card and will be broadcast on HBO in the U.S.